The ukulele always makes me happy. It should come as no surprise that the Sweet Hollywaiians put me in a good mood. 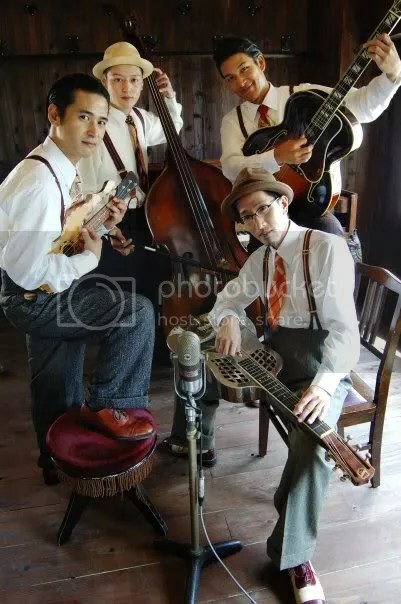 The Sweet Hollywaiians are based in Osaka and were originally street performers that shared a common interest in Hawaiian, swing, ragtime, and calypso music from the 20s and 30s. They formed a string quartet in 2002 to celebrate the long forgotten legends of the time such as Sol Hoopii, King Bennie Nawahi, Roy Smeck and Eddie Lang. They’ve put out four albums and toured worldwide, wrapping up a Canadian tour this week. The songs up on myspace are mainly instrumental Hawaiian pieces that range from hula-dance to mai-tai-on-the-beach. But there are several vocal pieces such as the excellent “Hula Girl.” The Hollywaiians also team up with Yumi Ishikawa on “U’i Lani” and “Maile Swing,” traditional Hawaiian songs that are just as sweet and melancholic as the originals. The interplay between the steel guitars, banjos, and ukulele’s are relaxing and more than up to the par to the legends of the past. If the Hollywaiians made you hula, pick up Ticklin’ The Strings and Hula Girl from CD Baby or their collaborations with Yumi Ishikawa and Tom Marion. Whether you need some Hawaiian music for a romantic evening or just something to drown your booze, the Sweet Hollywaiians are pleasant listening material. I guess this will tide me over until I can afford a damn vacation.